This week on Food Comas is dedicated to Thai cuisine! Normally around this time in Hong Kong, the summer season would be in full swing. Beaches would be full and the waters packed with junk boats on all-day booze cruises. As for us and our beach-obsessed dogs, we would usually be found romping around any remotely clean dog-friendly beach before settling in for lunch at our favorite Thai restaurant in Deep Water Bay. We would be there almost every perfect summer afternoon enjoying some spicy and refreshing Thai salads and freshly grilled seafood. Now that we have moved to the San Francisco Bay Area, the summer vibes are not quite the same with the fog and cold. While I certainly do not miss the 87% humidity paired with 87°F temperatures of Asia, I admit I am feeling nostalgic for a stereotypical summer. So to get through the “June gloom”, here are some delicious Thai recipes to bring on the summer tastebuds! One of my favorite Thai salads is made with pomelo, called Yam som o. Yam, which literally means “mix” in Thai, refers to a genre of salad-like dishes in Thai cuisine where the primary method of preparation involves − you guessed it− mixing. Other popular methods of preparations for Thai salad dishes include Tam (“pounded”) which is the technique used to make Green Papaya Salad (Som Tam Thai), and Larb (“to mince meat”) which is used to prepare Chicken Larb (Larb Gai). Pomelos may not be as common in Western markets, but they should be easily found in any Asian supermarket. I didn’t have any fresh Thai chiles (bird’s eye chilies) at the time so I used red pepper flakes instead, but trust me, fresh Thai chiles are the way to go for heat lovers! Thai salads should be consumed immediately after tossing for maximum deliciousness. They also do not tend to keep very well in the refrigerator so it is best to finish it all in one sitting… enjoy! 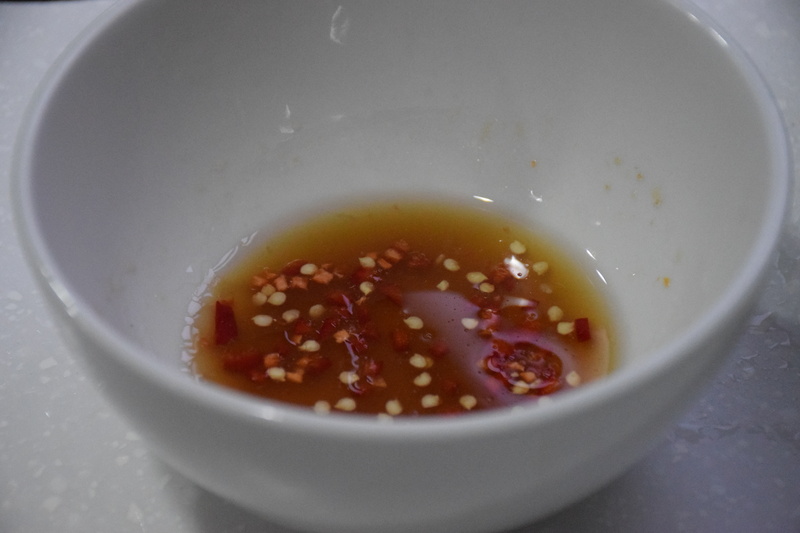 Whisk lime juice, fish sauce, oil, brown sugar and red pepper flakes in a bowl. In a skillet over medium-low heat, toast the shredded coconut until it turns a medium brown color and then set aside to cool. Be careful not to leave the skillet unattended, as coconut burns very easily. In a large bowl, add the shrimp, bell pepper, cucumber, pomelo, fresh herbs and toasted coconut. Toss well with the spicy sauce. Garnish with peanuts and serve immediately.